Navigator Maxor is a low energy, high output LED deck and recessed light which consumes a small amount of power and stays cool to the touch. E3311W-N is a low energy, high output white LED deck and recessed light which consumes a small amount of power and stays cool to the touch. The high output 1w white l.e.d. produces a wide 80° beam diffused by the 28mm diameter frosted lens. Navigator Maxor are used either to mark out the shape of a deck, patio or terrace, to outline paths and to light steps. 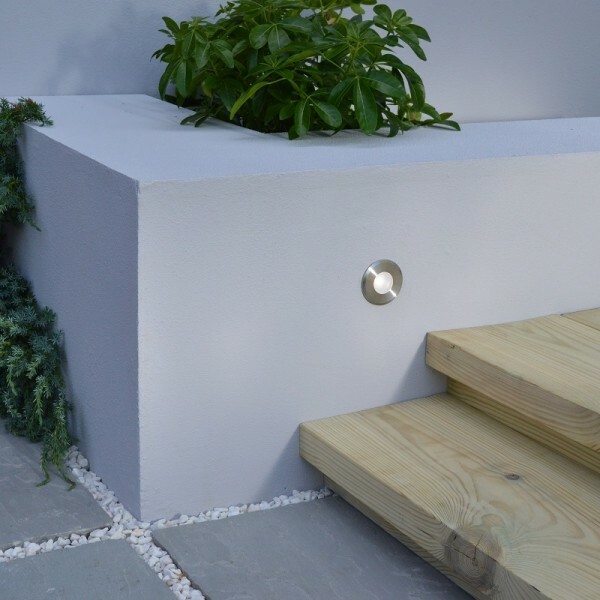 To outline a deck or patio space with a distinctive shape, start at the corners of the decking or paving and space led recessed garden lights at about 1 - 1.5m apart. The top section of this l.e.d. light can be unscrewed to allow the insertion of theatrical coloured gels to enable you to customise your garden lighting system.